Gmail users are not safe from phishing. Indeed, the e-mail platform of Google is also the prey of a phishing attempt, unfortunately quite well orchestrated. To understand this phishing on Gmail users, let’s begin by reminding what phishing is. Who has never received an e-mail indicating a refund due to an overpayment? Or a mail from a bank requiring you to enter your password as part of an audit procedure? The crooks send thousands of e-mails like these, pretending to be an official entity (Bank, Microsoft, Apple, …). Their goal is that a victim believes this and discloses personal information (Credit card number, password, …). This scam on the internet is what is called phishing. In the case of Gmail, the phishing attempt looks a bit different. The method is about sending a message to the person to be trapped. For more efficiency, scammers used a corrupted account belonging to a legitimate owner known by the potential victim. This mail invites the recipient to open a document stored on “Google drive”, the cloud storage service of the Internet giant. This service is pretty well known to familiar Gmail users. But after having clicked on the link, the Gmail login page appears of instead of the expected document. Surprised, the person thinks he / she has been disconnected and then enter again his email address and password. Unfortunately, this is where the fraud takes place. It was not an untimely disconnection but a misleading page displayed by the crooks after having clicked on the request to access Google Drive. The scammers have now recovered the login / password and then rapidly access the victim’s mailbox. They check e-mails for sensitive data. They also take advantage of this access by stealing the address book of the victim. The scammers can then reproduce the process of such phishing attempt. 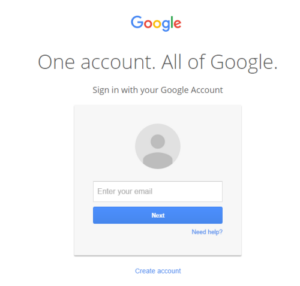 This phishing attempt targeting Gmail accounts is subtle and many skilled users get caught. A more discrete visible element of this fraud attempt is the URL used. This is different from the normal address: https://mail.google.com. But scammers know that we don’t always pay attention to the content of the bar at the top of the internet browsers. Be vigilant Gmail users! And pay attention especially if one of your contacts invite you to view a document on Google drive. A new extension called “password alert” warns the internet user when entering a gmail password on a phishing webpage. People often think that hacking is the prerogative of computer nerds who implement highly technical computer codes to enter secure servers. But the reality is much simpler. This is called phishing. Who has never received an e-mail from someone pretending to be your bank, your tax, or your Internet Service Provider, asking you to send your password? And it works! Recent hacking of Sony website is a very good example of spear phishing. Spear phishing is an alternative of the usual phishing attempt with personalized emails targeting some specific people inside the company. To fight against this scourge, Google has just created an extension available only for Chrome, the homemade browser of the famous search engine. During the installation of “password alert”, a “scrambled version of your password is stored on your computer” as stated in the presentation of the extension. Then “password alert” compares it with what you may type during your stay on the internet. In other words, if you enter your gmail password on a web page that is not authenticated as a login page to the Google services, the extension “password alert” will show on your screen a message, similar to the image of the article. The extension then prompts you to change your gmail password before it can be used fraudulently. Although the extension “password alert” appears, at least theoretically, a new step against phishing attempts, it presents some limitations. 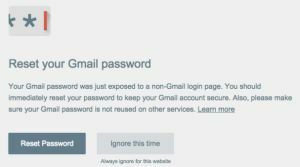 It only works on Chrome and it only works with your gmail password, it will not work if you use another email service. Paypal separates from eBay: Resurgence of phishing attempts! In September 2014, eBay announced the intention of separating from his Paypal subsidiary acquired in 2002. This separation, which is expected in the second half of 2015, is getting closer and the details of this divorce are being revealed. 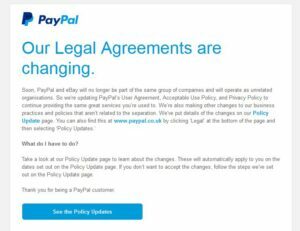 The email then prompts the user to click on a link for “details of these changes”, redirecting the paypal.com site and giving access to Policy update. The image above is the image of the email received from Paypal to indicate changes to come after his future separation from eBay. Scammers are always on the lookout for opportunities. You will probably also receive e-mails being phishing attempts usurping Paypal identity, or even that of eBay. Scammers will take advantage of the official communication to send phishing attempts in order to rip a few distracted or misinformed internet users about this practice.